The Jinping-I Dam (simplified Chinese: 锦屏一级水电站; traditional Chinese: 錦屏一級水電站) also known as the Jinping-I Hydropower Station or Jinping 1st Cascade, is a tall arch dam on the Jinping Bend of the Yalong River (Yalong Jiang) in Liangshan, Sichuan, China. Construction on the project began in 2005 and was completed in 2014. Its power station has a 3,600 MW capacity to produce between 16 and 18 TW·h (billion kW·h) annually. Supplying the power station is a reservoir created by the 305-meter-tall arch dam, the tallest in the world. The project's objective is to supply energy for expanding industrialization and urbanization, improve flood protection, and prevent erosion. Construction began on 12 November 2005. The dam began to impound its reservoir on 8 October 2012. First power was generated in 2013 with the remainder of the work to be completed by 2015. 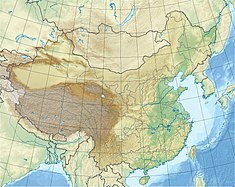 The rapid impounding has been linked to reservoir-induced seismicity by a Chinese geologist. Out of hundreds of small earthquakes during impoundment, three between 3.9MW and 4.58MW were recorded on 22 November 2013 on a nearby fault line. The 305m tall and 568m long arch dam supplies the power station with water from a 7.7 billion m3 reservoir, of which 4.9 billion m3 is active or usable storage. The dam itself has a structural volume of 7.4 million m3. To control flooding, the dam is equipped with a controlled spillway on its crest with four gates and the capability to discharge up to 2,993 m3/s (105,700 cu ft/s). Five bottom outlets on the dam's orifice capable of discharging 5,465 m3/s (193,000 cu ft/s) and a tunnel with a discharge capacity of 3,651 m3/s (128,900 cu ft/s) with augment flood control as well. The power station will contain six 600 MW Francis turbines. Water discharged from the power station is then diverted downstream by the Jinping 2 Dam to the Jinping 2 Hydropower Station. ^ a b "Jingping" (PDF). Chinese Committee on Large Dams. Archived from the original (PDF) on 17 December 2013. Retrieved 23 August 2011. ^ The Big River Bend and The "Jinping Dream"
^ "SDIC Electric Power: impoundment Jinping Hydropower Station" (in Chinese). Economic Times Network. 4 December 2012. Retrieved 10 December 2012. ^ "Jinping-I Dam impoundment linked to earthquakes". Probe International. 3 February 2014. Retrieved 2 April 2014. ^ "The world's highest arch dam Jinping first production unit" (in Chinese). Economic Times Network. 2 September 2013. Archived from the original on 9 September 2013. Retrieved 9 September 2013. ^ "Sichuan Investment and Energy: Jinping is now fully operational commercial operation" (in Chinese). Great Wisdom Finance Shanghai. 15 July 2014. Retrieved 7 January 2015. ^ ""West to East" backbone project Jinping Power All units put into operation" (in Chinese). 26 November 2014. Retrieved 7 January 2015.